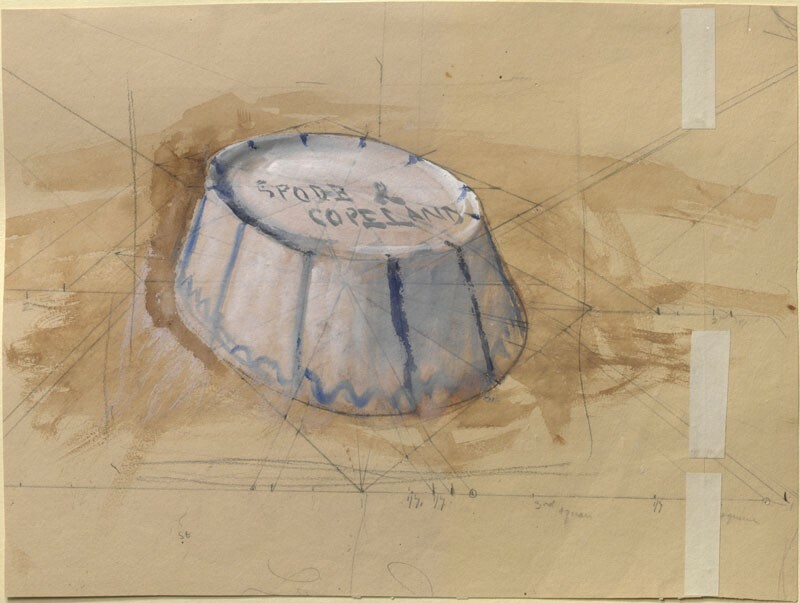 Recto: a white, oval bowl decorated with blue lines, placed upside down and seen obliquely from above. The surface on which it sits has been sketched in with broad strokes of brown watercolour. Beneath the watercolour and bodycolour can be seen a network of ruled graphite lines, organised around two horizontals and two sets of orthogonals receding to points beyond the upper left and right corners respectively, which define the perspective construction of the drawing. A crudely-drawn rectangle is indicated in graphite, defining the area to be made visible through the mount, approximately 14.5 x 17 cm. Verso: a cream-coloured tub with two vertical lugs sits on a blue-green surface, seen obliquely from above. It is contained in a similar perspective construction to the bowl on the recto, although on the verso this is not level, but tilts down to the left.